Climate change has now long been a global and growing conundrum. Calls for immediate action have resulted in governments and organizations undertaking initiatives to mitigate the effects. However, there is simply no denying the overwhelming deficiency in funds and resources when tackling local collateral caused by global warming. Take Kiribati as an example, a developing island republic in the Central Pacific constituted of 33 islands. With an average height of 2 meters above sea level, the combined force of global warming melting glaciers and climate change are expected to raise sea levels by a meter. While most countries will not experience direct damage by the rising sea levels, Kiribati -- which is already suffering from a multitude of problems, already mired in poverty, overcrowding, and poor hygiene – is sure to suffer the consequences. Even if the sea levels do not rise as predicted, Kiribati is in imminent need of help. The residents need a new supply of clean and fresh water (Kiribati has one of the highest infant mortality rates in the world, mainly due to contaminated water) and new homes due to displacements. Experts fear that as sea levels rise, Kiribati’s already fragile groundwater supply will face even greater risks leading to greater consequences such as droughts that will deplete the municipal and household supply of fresh water. 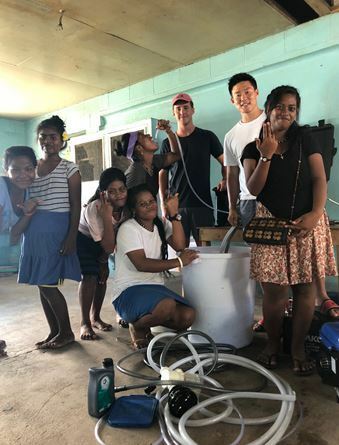 In response to these problems, Echo the Eco, a student-led non-profit organization has built a desalination unit, Aquifer 360, in South Taborio, Kiribati. The founder, SeYoon Yoon and CFO Will Powers hope to not only establish a fully reliable and lasting supply of clean water for Kiribati, but to also further extend their efforts to other countries suffering similar scourges due to the lack of attention and resources. They have visited Kiribati to help install the desalination unit, and have had raised $30,000 through fundraisers. As stated in their mission statement, Yoon and Powers are currently seeking additional funding to step up their help to others who are in dire need. COO Owen Chang has also jumped on board September, 2018 to further assist Echo the Eco's fundraising. Echo and the Eco has one simple goal in mind: To raise awareness of this little-known reality of island nations that are directly impacted by climate change. Yoon and Powers believe that it is vital that more people be educated on the damage to island nations due to climate change. To further actively raise awareness, Echo the Eco has created a YouTube channel, “Change Climate Change” -- a channel that consists of 30 second videos that educate the public regarding the impacts of climate change, scientific facts, and existing efforts that are being made. For more information, visit their website at www.echotheeco.com.